This is the public profile of Lo , Fang Ming, Additional information and high-resolution images are available for accredited press members, to access additional information about Lo , Fang Ming please login as a press member. About Lo , Fang Ming : Lo, Fan Ming is the founder of Dreamer Interior Design. He starts his design with the concept of seeing freely in Buddhism. The view is free and comes from the total connection between the people and the mind. Dreamer Interior Design highlights the harmony between humanism, natural environment, and life aesthetics. 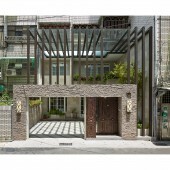 The designer understands the genuine needs of the occupants and uses interior design to tell each unique story of life. Mainly presenting the idea of aesthetics. The mentality of the occupants needs to plan for each occupant to belong to each family. Press Members: Request an exclusive interview with Lo , Fang Ming.